Samsung at its ‘A Galaxy’ event on April 10 unveiled the Galaxy A70 in addition to its rotating pop-up selfie camera phone, the Galaxy A80. The Galaxy A80 is a more premium device, while Galaxy A70 is a mid-range phone, which comes with an Infinity-U notch display, 4,500mAh battery and triple rear cameras. 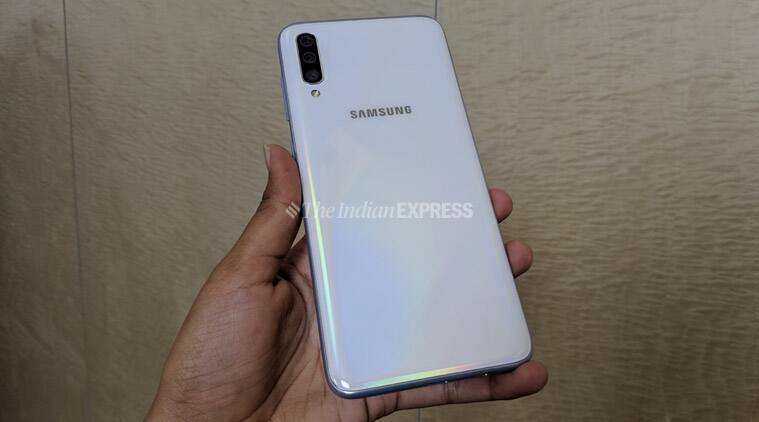 The Galaxy A70 will be available globally from April 26, though India price is yet to be confirmed. Other features include an in-display fingerprint sensor and 32MP front camera. We spent some time with the Samsung Galaxy A70 and here is our first impression. The design is very subtle and classy. The phone sports a plastic back cover that has a glass-like look and feel as well as reflective design. Thanks to the plastic body design, the phone feels quite light and sleek despite the large 4,500mAh battery. The display is Super AMOLED with a full HD+ resolution and Infinity-U design notch. One should not have any complaints on the display front as it is vivid and crisp and the U-shaped notch is quite small, so it should not hinder the viewing experience for users. However, the display is quite large at 6.7-inches, which some users might want to consider before buying. The phone has an in-screen fingerprint scanner, a feature we did not get a chance to try out. 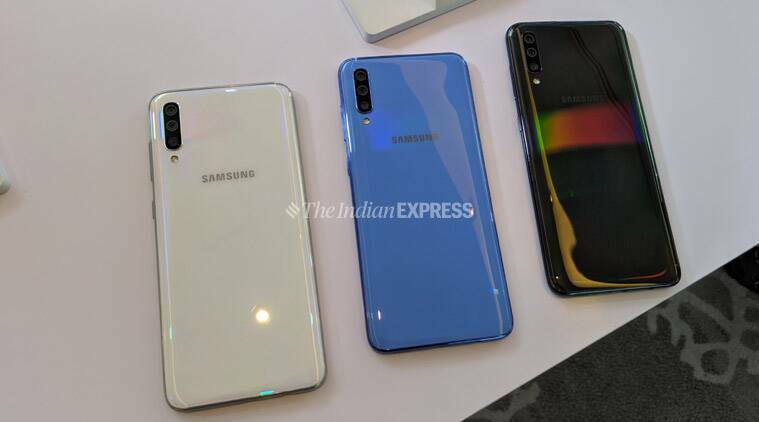 The Galaxy A70 sports triple cameras at the back, which is a combination of 32MP main camera, 8MP ultra-wide camera and 5MP depth sensor. I liked the photos that I clicked in a dimly lit room, which had accurate details as well as good colour reproduction. The front 32MP camera was equally good, though we will need to test the cameras in varied lighting condition before we reach a verdict. The back cameras support live focus, super slow mo, slow motion, hyperlapse, Pro and more modes, while with front camera users get live focus mode for Portrait shots. Samsung Galaxy A70 is backed by a Snapdragon 675 processor with 6GB/8GB RAM and 128GB storage, which is expandable up to 512GB via a microSD card slot. The battery is 4,500mAh, which should last for around two days with moderate usage. Another advantage is 25W super fast charging, which is good to see on a mid-range phone. Samsung Galaxy A70 can be bought in coral, blue, black and white colour options. The phone runs Android Pie based on Samsung’s One UI platform. Samsung Galaxy A70 could have a price of Rs 25,000 when it launches in India, though the company is yet to make this official. The A70 stands out for its display, battery, and cameras. 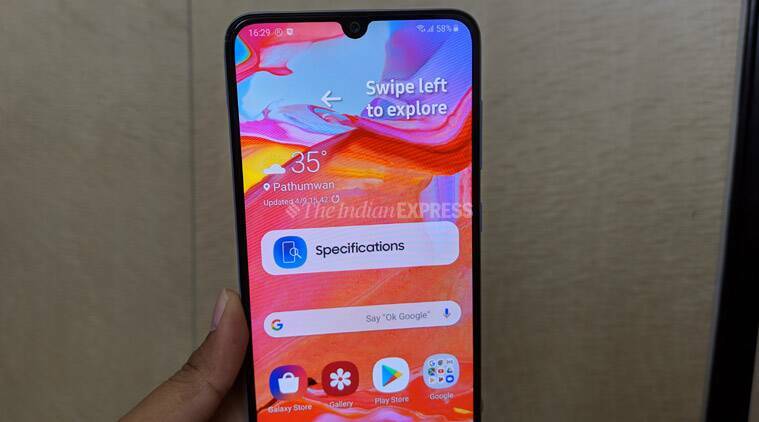 However, the price of the Galaxy A70 in India will play a crucial role in its reception in the Indian market. Galaxy A70 will have to compete against options like the the Poco F1, which has the flagship-level Snapdragon 845 processor and dual rear cameras for under Rs 20,000 along with the newly launched Huawei P30 Lite that also comes with triple rear cameras. The Huawei P30 Lite has a 32MP front camera and can be bought at a starting price of Rs 19,990 in India.